Hi! I’m Tara, a 25 year-old recently laid off medical sales rep now housewife. I’m a nerd with a microbiology degree that loves books, running, yoga, music and laughing. My husband is also working on his own 101 list. We don’t have kids, but we do have a sometimes adorable kitty named Luna Bella. For more info on me feel free to check out my other blogs (My Day in Six Words or Time Vampire) or my twitter. You can also reach me on the Contact page. After stumbling across a blogger doing Mission 101, I fell in love with the idea. So I created my own list of 101 goals! Next to each of my goals you can find a link to more info (yes, I’m also an organizational freak with slight OCD). I’d love to hear suggestions for books, movies, travel or advice in general. Help me reach my 101 goals by leaving recommendations here. The 101 in 1001 Challenge is very simple. Just create a list of 101 goals to accomplish over 1001 days. These should be things that are measurable, that are achievable, but that in some way present a challenge. As a terrible procrastinator with a passion for list making, I’m using this challenge to add some adventure/culture/healthy habits to my life as I work my way out of a quarter-life crisis. I started my 101 Challenge on May 17, 2009 and finish 2.75 years later on February 12, 2012. For more info on 101/1001 check out DayZeroProject.com. Thank you for the link to my blog! Yes, it’s definitely a great idea and I am having so much fun with it. I love your post where you have excel spreadsheets on your fridge for easy tracking, that’s a GREAT idea. Goodluck with your list, too!! Thanks! i’ll be sure to check yours out when I get home from my trip! I just stumbled across your blog and I’ll definitely be adding you to my blogroll. Someone who liked “The Road,” reviews movies, and posts recipes? It doesn’t get much better than that! Thank you!! I’ll be adding you to my links as well. I’m looking forward to finding new movies to check out from your blog! This is awesome! I’ll be following your progress. Good luck. You’ve inspired me. I’m thinking about starting my own 101/1001! Thanks :) I think the easiest way to start a list is to steal ideas from other 101ers lol. I’ve got quite a few on my links page, but there are a ton at Day Zero. Good luck!! 101 goals in 1001 days…? = 1 goals in 9.9108910891089108910891089108911 days… am i correct? I’m falling more and more in love with 101/1001. I started researching it in March, and now that I’ve compiled (well…mostly compiled) my list and started doing things – I love finding out that there’s a WHOLE network of people who are ALSO doing it. I’m going to add you to my blog roll to keep track! Thanks! 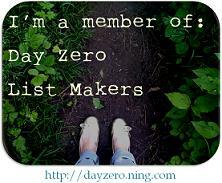 I’m glad you joined the Day Zero group!! Ok I am not going to lie. I am so jealous of this list and idea and I bought a brand freaking new note book and I am going to do this!!! I prob won’t keep a blog but I will be sure to let you know how my progress goes!! Ah I am excited!! I just happend to come across your blog and I love the idea of 101 goals in 1001 days. I am starting my own challenge to become vegan for one year starting in October. I will be checking back often as it is always encouraging to see others achieving their goals.